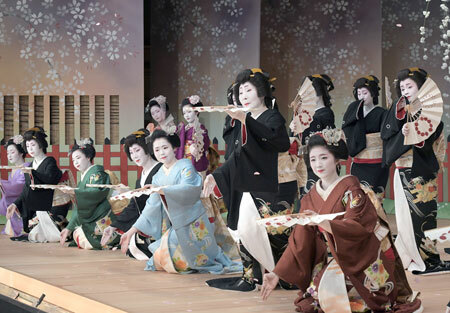 Prior to the inauguration of the 65th "Kitano Odori," a dance performance from March 25 to April 7 in Kamishichiken, its pre-event was held on March 24 in the Kamishichiken Kaburenjo Theater, Kamigyo Ward, Kyoto. As "Geiko" and "Maiko," or geisha and apprentice geisha, dressed in gorgeous costumes danced, the invited guests felt the advent of the spring a little earlier than anywhere else. Twenty-six geisha and apprentice geisha will appear in two-part performance. The first part is a dance drama titled, "Enishi no Miya, Sue wa Hitotsu ni Naru Monogatari," which emotionally describes a love affair between a young prince and a dancer, who are of unequal social rank. The second part is a dance-only performance titled, "Ryojo Tokoro Dokoro," in which dancers consecutively show music and dances featuring traditional events and folk songs from across Japan, such as "Yosakoi" from Kochi Prefecture, "Yamanaka-bushi" from Ishikawa Prefecture, and so on. As usual, all the dancers performed in "Kamishichiken Yakyoku," in which geisha in black kimono with long trains and apprentice geisha in colorful kimono together set the finale alight with their glamorous dance. The performance will be held twice daily. The admission fee is 4,300 yen, or 4,800 yen with a tea ceremony ticket. For more information, call Kamishichiken Kabukai at 075-461-0148.